Give a sampling of all of our most popular Easter gift selections with our four-tier Large Easter Gift Tower. Each tower is finished with a hand-tied lavender satin ribbon. 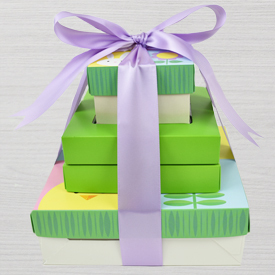 Bottom Tier: A Two Layer Deluxe Collection Box - contains 32 pieces, 2 each of our 16 best sellers with a bright and colorful Easter topper. Third Tier: A half-pound box of creamy Milk Chocolate Easter Bunnies, individually wrapped in bright, fun Easter foil. 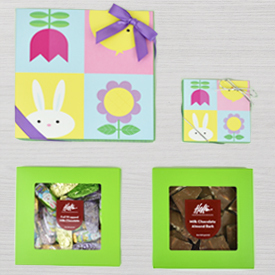 Top Tier: A special Eight Piece box filled with our Classic Milk Chocolate Truffle, and finished with an Easter topper.